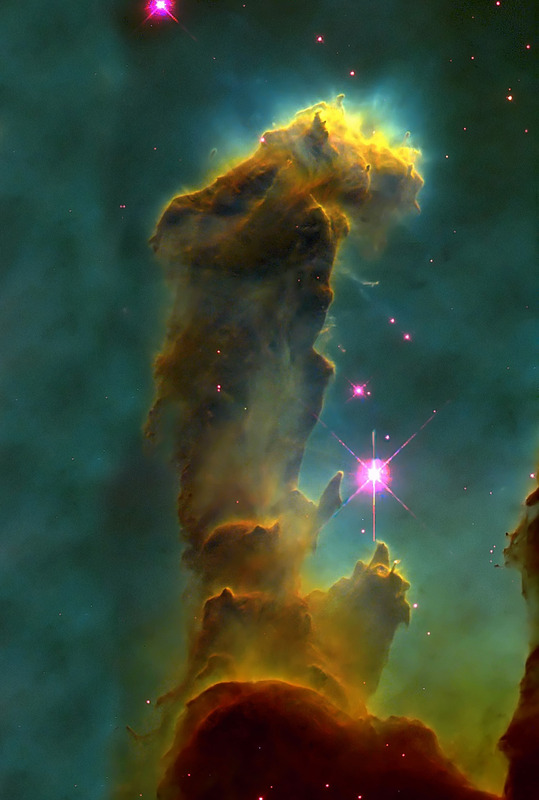 Rather than being a stellar nursery the famous dust clouds in the Eagle Nebula may already be gone. Star-forming regions within nebular dust clouds have been discussed many times in previous Picture of the Day articles. The prevailing opinion among astronomers is that stars are created from the collapse of such clouds through gravitational attraction: the Nebular Hypothesis. The theory seems plausible because astronomical images portray what appear to be clouds so dense that they are opaque to visible light and span tens of light-years. What is not usually mentioned in the press releases is that the nebulae are composed of gases and dust a thousand times less dense than a puff of smoke. The Hubble Space Telescope photographed the similarly diffuse three pillars in 1995 using its optical sensors, but according to observations by the Spitzer Space Telescope a shock wave from a nearby supernova may have already destroyed them. 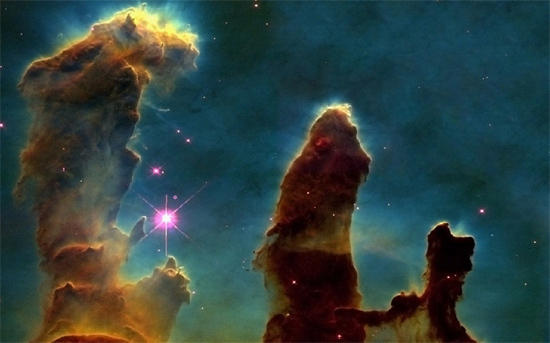 In fact, the Pillars of Creation may have ceased to exist about 6,000 years ago, since there are several candidates for such explosions scattered throughout nearby space. Stellar ignition is dependent on compressive forces, so most astronomers conclude that shock waves of some nature are necessary for nebular clouds to condense. Supernova blasts are supposed to provide the impetus needed for the initial collapse and to “seed” the region with larger granules that will cause more dust to be attracted to them, as well. Thus, nebulae are deemed “star-forming regions”. Apparently, Spitzer confirmed that there is an arc-shaped wavefront of luminous material moving through the Eagle Nebula. Due to the great distance involved, infrared radiation emitted from the shell of expanding gas is visible as it was 2000 years ago, so in “real time” it already impacted the Pillars. The visible-light from the supernova might have been seen on Earth about that time as a “new star” in the night sky. Conventional theory suggests that a compression wave from the supernova as we see it now will both destroy the cloud formations in M16 and begin the process of star birth from the ashes of their destruction. Has science actually increased knowledge with theories such as these? Or has it spun an elaborate tale based on the slimmest of evidence? The birth and death of stars is illustrated in such stories of gravity and inertia, but they are missing key ingredients that provide continuity to the plot. Where is electricity and conducting plasma filaments to carry the current? Both are ignored. How does the heated gas collapse instead of dissipate, as thermodynamic physics would insist? The Electric Universe theory relates a more reasonable account. Instead of “hot gas and compressed dust”, it is plasma and electric currents that form electric stars. Birkeland currents power and shape the galaxy and are constricted by the magnetic fields they generate. Hot gases and dust are prevented from dispersing inside their multi-light-year-long helical coils. When the current density inside the twisted filaments gets high enough the plasma that carries the current begins to glow and to “pinch” into plasmoids that eventually become stars. When the electrical stress is low and the plasma contains a lower concentration of dust, only the star “lights up” in arc-mode discharge. Where the electrical stress is greater, as in the Eagle Nebula, disks, jets, and the surrounding gas clouds can also light up. Of course, dust clouds can reflect the light from nearby stars, but these glowing plasma formations show the characteristic filaments and cell-like behavior seen in plasma computer simulations.